The Gefen EXT-HDMI1.3-242 is a 2x2 Switcher for HDMI 1.3 which is equipped with two HDMI inputs and two HDMI outputs. 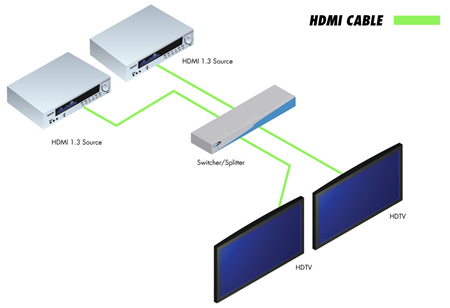 Two inputs accommodate the simultaneous connection of up to two high definition video sources, such as satellite systems and Blu-Ray players. Two outputs send the high definition audio/video signals to up to two HDTV displays. Switching is done via the included IR remote. Note: All displays that cannot show the same video resolutions as the Primary Display connected to Output #1 may fail to show a picture. Secondary displays follow the Primary by sharing the resolution and capability information (EDID) obtained from the Primary Display.